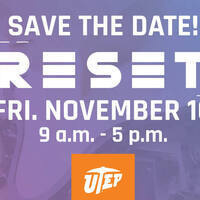 The University of Texas at El Paso will co-host RESET, the largest binational innovation and entrepreneurship summit on the U.S.-Mexico border, in November. RESET, a free event where innovation and technology merge, is designed to inspire young minds through a combination of unique experiences including panels, workshops and speakers. The three-day event will take place from 3 to 6 p.m. Wednesday, Nov. 14 and 9 to 6 p.m. Thursday, Nov. 15 at Technology Hub in Juárez, Mexico; and from 8 a.m. to 6 p.m. Friday, Nov. 16 at UTEP’s Undergraduate Learning Center. Information: www.reset.ws or @reset_the_mind on Twitter.